Wikipedia defines Coyote as “a colloquial Mexican-Spanish term referring to the practice of people-smuggling across the U.S.-Mexican border”. 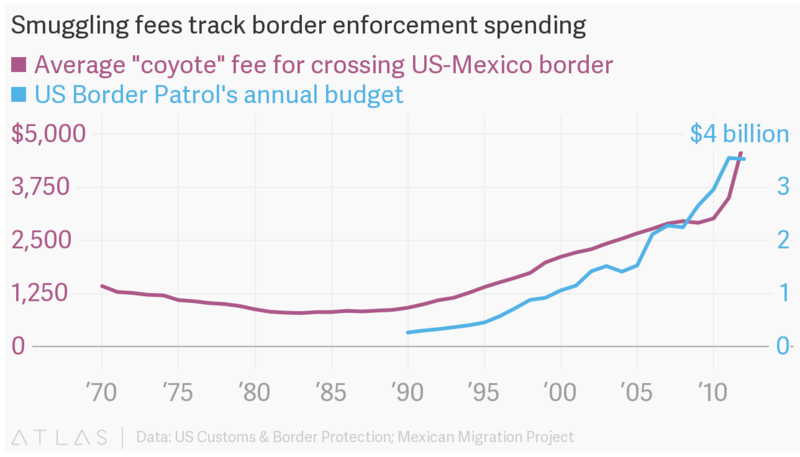 In border crossing, the coyote assists a migrant in crossing for a fee, which is usually fairly costly, and the costs are continuing to increase (Campoy 2017). The coyote uses their knowledge of the border and security to make money off of the people hoping to cross and come to America. Ramon, a coyote from Reynosa, Mexico, smuggles people from from the Mexican side of the Rio Grande to the U.S. side. He makes up to 4 trips across the border per week, and has been doing so for almost 6 years. Ramon charges between seven and ten thousand dollars for the whole trip (Bonmati 2016). This money is then partially transferred to the drug cartels, who have control of parts of the border and help the migrants across, as long as they are paid. 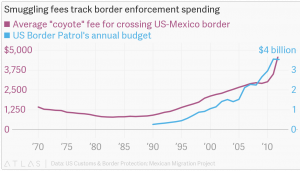 This graphic illustrates the increase in pricing of using coyotes to assist in crossing the border. Some coyotes are known to scam migrants, promising them a full crossing and leaving them before the trip is over, or often overcharging them for a small part in the journey. Ramon noted that the worst coyotes are the ones who require a full payment upfront. He says these are the ones who are least likely to really take the migrant where they want to go. Instead, the coyotes who are not scam-artists have the migrants travel part by part. For Ramon, the job is to get the migrants across the border, but not necessarily help them mich before and after. Those parts are another coyote’s specialty. Coyotes who promise to take the migrants the full way are usually scams, according to Ramon. Unlike many coyotes in the business, Ramon actually cares about the people he is helping. He promises them that he will try again if they fail on the first try, and he also says he will try again if they are deported once in the U.S. All he asks is that if they are caught, that his clients do not identify him by name. A photograph of Ramon from behind, as he does not want to be identified. 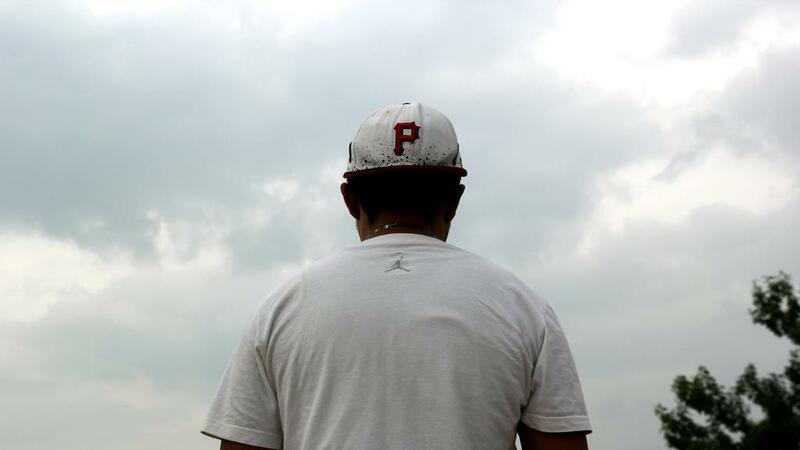 Ramon’s contribution to human border smuggling is helping people who need to get to America. He treats his clients as people, preparing them psychologically and physically before the journey, and helping them get to their destination to the greatest extent that he can. This sort of coyote work is beneficial, and can prevent the huge numbers of deaths that occur while migrants are crossing the border. But, the coyotes who scam the migrants for money are only hindering the system, and making it more unsafe to try and cross. If a migrant is able to pay, having someone like Ramon to work with seems like the best and safest option for crossing the border. “Inside The Hidden World Of Immigrant Smuggling.” NPR, NPR, 19 Apr. 2012, www.npr.org/2012/04/19/150973748/inside-the-hidden-world-of-immigrant-smuggling. Noticias, Univision. “Animation: How a Coyote Smuggles Hundreds of Immigrants.” YouTube, YouTube, 19 Dec. 2016, www.youtube.com/watch?v=4-9JVUibkAo. Since ancient times, obsidian rock has been useful in tool making, as well as serving many other purposes. Obsidian is an igneous rock which is rich in silica and has a low water content. It appears black and shiny in its pure form but is often covered in an outer layer that is more brown in color and appears dull and rough. Obsidian rock was used by early human civilizations to create tools such as arrowheads, blades, and other sharp objects. It is also suggested that obsidian tool knapping could have been used in some cultures as a way for male knappers to impress potential female partners. Using knapping- the creation of stone tools by way of percussion- early humans were able to produce almost-modern objects, some of which are still being utilized today. 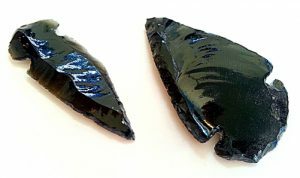 Two arrowheads produced from obsidian through the process of knapping. Arrowheads would only be found in areas where hunting by bow and arrow was prevalent. Obsidian is especially useful for its sharp properties, and this is the reason obsidian tools are still on the market and being studied and used in the twenty first century. Obsidian has incredibly useful and unique properties. The average household razor blade is somewhere between 300 and 600 angstroms (unit of measurement used to measure blade fineness). An obsidian blade measures in at only 30 angstroms, making it very useful in precise cutting. For its extreme sharpness, modern surgeons have continued to utilize obsidian tools in their work, especially in precise surgeries. Specifically, Dr. Lee Green at the Department of Family Medicine at the University of Alberta says it is not uncommon for him to use obsidian blades in his work. Obsidian’s makeup creates a smooth and continuous edge on a blade, while regular steel tools have a rough edge on their blades at a microscopic level, which can tear into tissue and leave the patient with a longer healing process and more intense scarring. 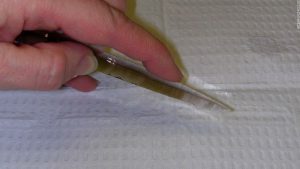 Green has observed that following procedures with obsidian scalpels, patients experience much less scarring than in the same procedure done with steel tools. A modern obsidian scalpel. These scalpels can be used for precise cutting in surgery. While it may seem odd to be using tools from the stone age in modern medicine, the blades being used today are different than those of ancient humans. Dr. Green receives his obsidian scalpels from an expert flint knapper, Errett Callahan. Green also knows that using obsidian in medicine is a technique is not useful for every procedure and for every surgeon. Obsidian tools have their time and place. The scalpels can also be helpful for patients who might be allergic to the materials used for most surgical tools, such as steel and metal. Shadbolt, Peter. “How Stone Age Blades Still Cut It in Surgery.” CNN, Cable News Network, 2 Apr. 2015, www.cnn.com/2015/04/02/health/surgery-scalpels-obsidian/index.html. King, Hobart M. “Obsidian.” Geology, geology.com/rocks/obsidian.shtml. Britannica, The Editors of Encyclopaedia. “Obsidian.” Encyclopædia Britannica, Encyclopædia Britannica, Inc., 10 May 2018, www.britannica.com/science/obsidian.